Allah says in His Glorious Book: “And seek assistance through patience and prayer, and most surely it is a hard thing except for the devout who believe that they shall meet their Lord and that they shall return to Him.” (02: 45-46). Man might face in his practical life the pressurizing influence of lust urging and intriguing him to succumb to the call of his innate nature and forsake the call of Allah. He might also fall under the spell of greed that urges him to let go of his faith and principles just to gain money or a dignitary status. He might also encounter external pressures breaking into his life and threatening his existence; thus, yielding to its deviating influences away from the line of Allah… But the question is: How can he face all that? Those two verses intrigue in man the sense of faith in Allah through the practical means of faith that enable man to hold fast to the line of the right down the treacherous slopes. Actually, Allah pinpoints two means: patience and prayer. As for the payer, it is the route through which the believer ascends to his Lord; it marks the ascension of his spirit, conscience, heart and thought. They would meet Allah in moments of glorification and openness, and they would acquire the great connotations roaming in Allah’s wide horizons. As man’s heart gets attached to Allah, his soul would open up to the great morals Allah wanted him to get hold of in life; and as man reaches this state of openness and lives in these wide atmospheres, his main concern would no longer be focused on the small issues and he would no longer be intrigued by anything the people were used to have their conscience and lives intrigued with. In the light of this, we notice how this Ayah is addressed to the Jews and others who have deviated from the straight path, as if telling them: Your problem revolves around two essential points of weakness; on the one hand you forget Allah, and on the other you fall prey to the temptations and pressures. Once you forget Allah, you will surrender to Satan and lose all the spiritual ambiences that can be reflected with all the good and openness on the big issues in life, and your concerns will be focused on and restricted to the tiniest limited details that result in enmity and hatred and bring about feud and conflict… Once you fall prey to the temptations and pressures, be they internal or external, you will leave your values behind… Therefore, if Satan tries to trick you and lure you into his temptations and schemes, seek assistance through patience that can empower you with the willpower that makes you stand strong; thus, placing your issues, principles and morals back on the right track of faith; and if you forget Allah, seek assistance through the prayer that makes your souls ascend to Allah and enable you to live and be worthy of the ever-flowing graces and blessings of Allah. Talking about “meeting” Allah is not in the materialistic and concrete sense, for Allah is never personified as other beings; but rather, it signifies the Day of Judgment on which the people are gathered and judged by Allah, whether rewarded or punished, considering that it is the day in which no form of authority appears except Allah’s, for He says: “The day on which no soul shall control anything for (another) soul; and the command on that day shall be entirely Allah's.” (82:19). It would be as if man is meeting Allah by picturing His presence there, by feeling His absolute ability. In this sense, a question cannot but be asked on the reason behind using the word “believe” instead of “certainly know” which is more suitable in this expression considering that it represents man’s clear mind; thus, increasing his piety? It is worth mentioning that this is the method the Quran adopted in several Ayahs, one of which expressed that the believers hope to meet their Lord: “Therefore whoever hopes to meet his Lord, he should do good deeds, and not join anyone in the service of his Lord.” (18:110). It goes without saying that this method is not based on belief only, but it is a means to reach certainty eventually, by taking man out of the state of carelessness into the state of the responsibility of the thought and practice. It is narrated in Majma’ Al-Bayan that whenever the Prophet (p.) was saddened by something, he sought assistance with prayer and patience, considering that fasting is an act of patience. 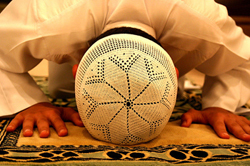 The first point: The first Ayah lays emphasis on the worshipping aspect, such as the prayer and fasting, and on the moral and psychological elements such as patience and the like that help in building the character of the Muslim so as to keep him away from any form of practical and intellectual deviation for that is what pushes him forward and helps him to stay on the right track. We feel that there is a need to encourage strongly on that in our guidance and education and not to be satisfied by the intellectual debates that do not drive man to take actions on the ground, for that might be useful to the people who differ with him over the bases of faith. As for the believers who deviated from the line and not from faith, they are in need for guidance that prepares for them the means of discipline in the course of strengthening their faith, knowing that there is no difference in that between the traditional believers who live the traditional faith and the believers who live the faith that is afflicted with some urgent deviations… The best method to deal with them is that of practical education that deepens the traits of patience and submission, which bring them closer to Allah. As for the method of bringing up the intellectual issues that are meant to deepen the intellectual aspect of faith, it might lead to the opposite of what is aspired as it might create new problems in faith, which was not taken into account in the beginning. Therefore, there should be a waiting period until the believer strengthens his attachment to Allah in a way that he would no longer be derailed from the straight path or destabilized by an intellectual problem. Second point: The second Ayah focuses on the method of preaching that relies on reminding man of the Hereafter in the course of encouraging and urging him to work for its sake and that he shall return to his Lord, for man’s make-up includes an emotion-related region linked to the reactions and emotions and not to the abstract thought. It might not be enough when that region is incited to say that Islam will solve all life’s problems and to talk about the nature of the philosophy that entails all the aspects of the universe; but rather, all that should be linked to the issue of fate and man’s stand from Allah and the fact that he will have to face him on the Judgment Day when he will be held accountable for every deed he has done, be it evil or good, for that renders the soul spiritually submissive to Allah as part of his total submission to Him. An aware study of the Quranic methods adopted for the call makes clear how the Quran focuses on this method, as we find that the Quran left no opportunity for preaching without actually seizing it, which drives us to consider it a special Islamic trait in the method of the call to Allah.